Ridge upon ridge of forest straddles the border between North Carolina and Tennessee in Great Smoky Mountains National Park. 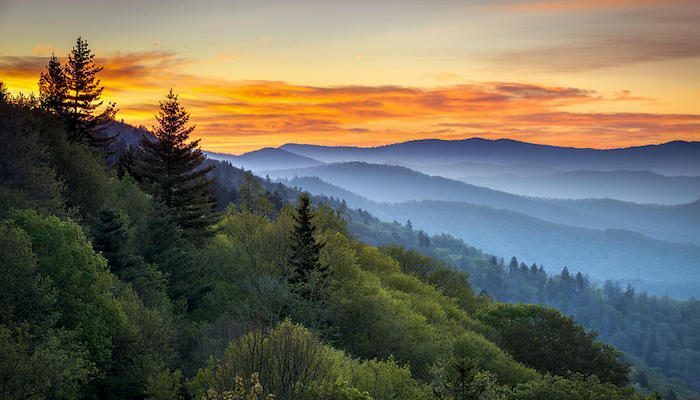 The park is world renowned for its diversity of plant and animal life, the beauty of its ancient mountains, and the quality of its remnants of Southern Appalachian mountain culture. This is America’s most visited national park. The Appalachian Trail passes through the center of the park on its route from Maine to Georgia. The main park entrances are located along U.S. Highway 441 (Newfound Gap Road) at the towns of Gatlinburg, Tennessee, and Cherokee, North Carolina. The Cades Cove Loop winds for 11 miles through the Great Smoky Mountains National Park. It offers runners a picturesque route filled with views of the mountain peaks, wildlife viewing opportunities and several 19th century homesteads. The loop is a one-lane paved road. Bike, cars and pedestrians usually share the road but every Saturday and Wednesday morning from early May until late September the loop road is closed to motor vehicles until 10:00 a.m. This is the best time to run! 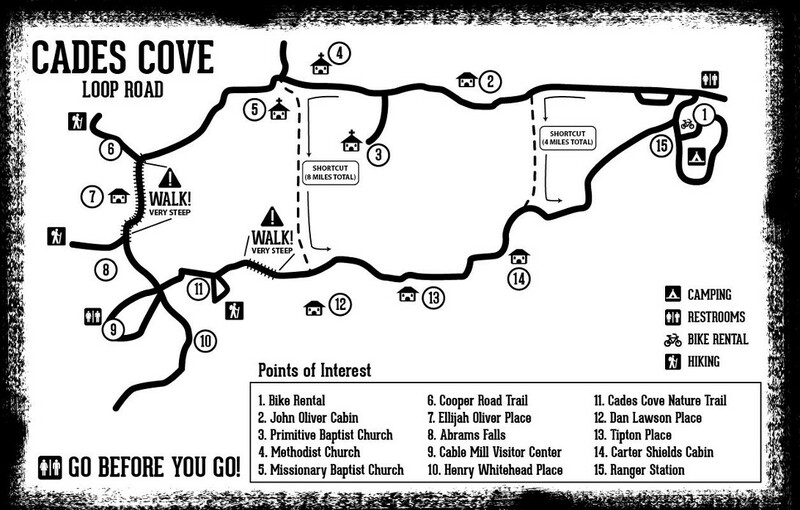 If you start at Cades Cove Campground on the East side of the loop, you can make the route shorter with two possible shortcuts. For a 4 mile run, use Sparks Lane right before the John Oliver Cabin. Alternatively, use Hyatt Lane (located right after the Methodist Church) to create an 8 mile loop. The Cades Cove Loop is a must if you want to truly enjoy the beauty, wildlife and serenity of the Great Smoky Mountain National Park. Greenbrier is one of the great off-the-beaten-path areas of Great Smoky Mountain National Park. It is generally not very crowded, but boasts some of the best spring wildflower viewing and fall leaf peeping areas. It is located about 6 miles east of Gatlinburg on US 321 and features a 6 mile gravel road that’s great for running. This route follows Little Pigeon River and its tributaries into the upper Greenbrier area. Park at the Porters Creek trailhead and run along the quiet Greenbrier Rd. for as long as you desire. On your return, take Porters Creek Scenic Loop to mix up the scenery. Although the scenery is relaxing, note this is a hilly run.